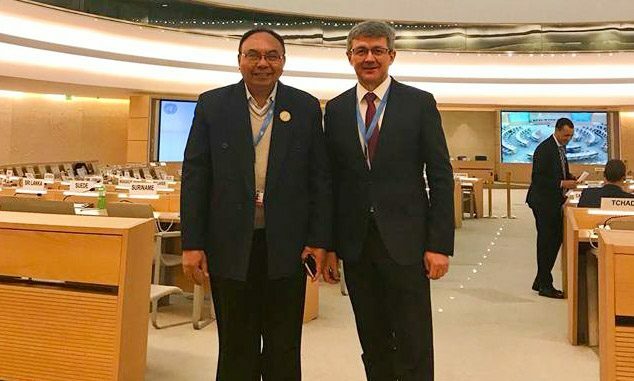 VIVAT International delivered during the 37th session of the Human Rights Council as a joint statement with Franciscans International which highlighted the issue of human trafficking in Indonesia and Malaysia specially focusing on the poor working conditions of Indonesian in Malaysia. VIVAT International and Franciscans International would like to express their concern on the situation of trafficking in person and migrant workers from Indonesia. The exploitation and mistreatment to the Indonesian migrant workers are still continuing today, especially those who come from East Nusa Tenggara Province who work in Malaysia. In February 11 2018, a 21 year old Indonesian women from East Nusa Tenggara Province (NTT), died allegedly as a result of mistreatment by her employer in Penang in Malaysia. Before dying, she was found sitting helpless on the porch of her employer’s house in the company of a Rottweiler-style black dog tied to the rope beside her. She was rushed to Bukit Mertajam Hospital, but she passed away. The neighbors around the employer’s house told, more than a month Adelina was forced to sleep with the dog Rotweiler on her employer’s porch. When encountered, Adelina’s head and face were swollen. Her legs were covered with wounds and infected. She was allegedly victim of human trafficking. In the first two months of this year, twelve (12) migrant workers from East Nusa Tenggara died in Malaysia. We regularly receive information that the migrants have often been exploited and tortured. In addition, they have limited accees to health care and services, which lead to permanent disabilities or death. In 2017, it is estimated that 1.9 million of the 4.5 million Indonesians working abroad – many of whom are women – are undocumented or have overstayed their visas. This increases their vulnerability to trafficking. The number of Indonesian migrant workers who died at their work place tend to increase in last seven years. The government agency in Kupang Regency reported that in 2017, 67 migrant workers from East Nusa Tenggara died in Malaysia,  with the total of 217 Indonesian migrant workers died between 2016 and 2017. The International Organization for Migrants (IOM) reported that from 2005 to 2014, there were 7,193 victims of trafficking in persons in Indonesia, of whom 82 % are women and girls, and 85 % are undocumented migrants (consisting of 955 young girls, 4.888 adult women, 166 young boys and 647 adult men). To the Government of Indonesia: ratify without delay the ILO Convention No 189 on Domestic Workers; implement without delay Law No 18, 2017 on the Protection of Indonesian Migrant Workers; and adopt moratorium policy of sending migrant workers to Malaysia. To the Government of Malaysia: ratify without delay the ILO Convention No 189 on Domestic Workers; UN Convention on the Protection of Rights of All Migrant Workers and Members of Their Families; and investigate all human rights violations on migrant workers.